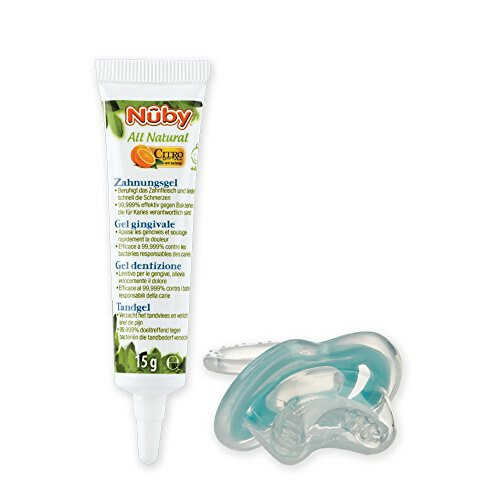 I’m a big fan of Nuby products so I was very pleased to find this teething gel when actually shopping for another brand! The gel has a strong clove smell and my baby was not a fan of the taste at all, however she settled brilliantly after applying some to her poor red gums! She has never seemed to care for teething dummies shaped like this so it wasn’t really a surprise that she didn’t take to this one either. A YES to the gel but a no to the dummy! My baby likes this product but I feel the mouthpiece could be smaller it seems to big for my sons mouth. The gel is good and my baby likes the taste of it. My daughter is 4 months and although she likes the taste of the gel she keeps dropping the teet part as it is not the right shape for her gums. Great idea if your baby likes a dummy anyway. Baby is only just starting to teeth but when he has times he needs soothing this has really helped especially as it comes with the tether for him to chew on. I really like the design but the cover do not stay in place so for that reason is not very hygienic. My baby loved the teether but truly hated the gel. A good design you can attach the tether to the dummy holder, so I saving from losing :). We have been using this teether with different gel and works really good. Easy to sterilize just pop to a cup of hot water. So sadly have to be 5 star for me due to the gel and lack of colour choices. We barely used the gel as my little one didn’t like it. The thether however is perfect for administering our chosen gel and makes using it so much easier. My little girl loves this used it from 3 months she has been teething from about 4 weeks and bee n trying to find one that helps and I can honestly say she loves this one and holds it in her mouth well for a little minute or so but it helps her and calms her.down a lot. The gel is horrible! Made my baby sick and when I tried it it made me gip! The teether is great though he used it with bongela on it instead or nothing. My sister got this for my son at Christmas and it was brilliant. Honestly. Worked straight away and he was fine for hours. Unfortunately my dog eat the dummy but so after that it wasn’t as useful. My 3 and a half month old has been showing signs of discomfort with her gums/teeth. This teether together with the gel calmed her down. The gel smells strong but this doesn't seem to bother her or the taste of it. As with other teethers we have to hold the dummy in her mouth for her to chomp on. I reckon as she gets older she will be able to do this herself. The teether helped a lot as it’s like a dummie so baby is use to it and easy for them to bite down onto it helping smooth there sore gums. We ended up only using the teether as the baby likes it. Had to throw the gel as it didn't help and the baby never wants to take it when it has gel on. Normal teething ring and the gel worked for us. We had an early feather so grabbed this thinking would help, she hates it, too big for her mouth and hit her gag reflex a lot. Plus as it looks like a dummy she didn't understand at all and tried sucking it. Nice idea didn't work for us. 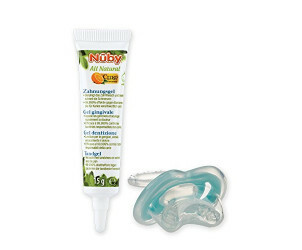 Nuby's Gumeez Teether and All Natural Teething Gel provide instant relief of baby’s sore gums. The teether’s unique texture delivers comfort to baby’s sensitive gums and provides stimulus to the lips and tongue, to facilitate weaning. Suitable for day and night use, the gel is lidocaine free and is safe to swallow.